The Juggernaut Begins! | Leah Palmer Preiss ~ Curious Art: Acrylic painting on text collage on canvas, 6"x6"
The Juggernaut Begins! Acrylic painting on text collage on canvas, 6"x6"
Oh, you thought I was talking about the relentless march of the holiday retail machine? Nope, that’s last week’s news. Now it’s time to brace yourself for this year’s mighty, unstoppable A.Word.A.Day illustration series! Though the word’s origins lie in Hindu tradition, my thoughts went immediately to Godzilla, then back to earlier rampaging Asian monsters. A gigantic golden dragon could certainly destroy a city, while forming a fairly convincing curiotype letter “J”! This painting & prints thereof are now available while they last* in my Etsy shop. So I guess now we’re back to the holiday retail theme. ;-) *Original art SOLD… wow, that was fast! More A.Word.A.Day art to come! Tomorrow some kitschy cluckers clutching coffee. Can you guess the word? 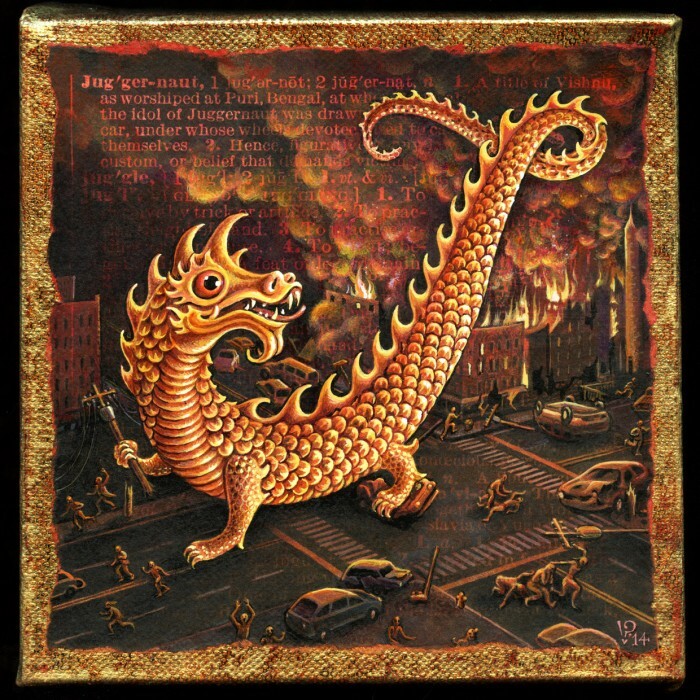 This entry was posted in A Word A Day Illustrations, Paintings, Prints Available and tagged A Word A Day, Acrylic, AWAD 2014, Cityscape, Creatures, Destruction, Dragon, Juggernaut, Leah Palmer Preiss, Painting, Prints on Etsy on 8December 2014 by Leah. congrats on the sale of the original! Thanks so much for the kind comments & for coming to visit, Tammie! It’s always great to see an old friend again!